In large bowl, add 1 1/2 cups of flour and beer, stir well. Stir in salt, pepper and garlic powder. Season fish with salt and pepper. Dip fish in beer batter, then dip fish in remaining 1/2 cup flour. Place fish in hot oil. Fry fish for 4 minutes. Remove fish to a paper towel line dish, to drain. Serve with french fries or baked potato wedges. Enjoy! You did get good results with very few ingredients. I am used to using milk and eggs in batter, but this looks like it is well worth a try-so crispy. It's an open secret that I "the vegetarian" like fish and chips a lot...but only a few times a year. :) That looks delish! I am a HUGE fan of freshly ground black pepper. I could never understand why Chef Anne Burrell doesn't like it. However, it's gotta be freshly ground...makes all the difference in the world! I wish I could indulge in the fish! The fish and chips look delicious! Great recipe! Christine, this would be delish with your Fancy Green Beans! (My hubby got one serving of them... I ate the rest!) Thanks for a great fish batter recipe! I love fish and chips! Great recipe, Christine! Mmm, looks so good. You know I love me some fish n chips. This is a lovely recipe. I wish you could indulge in the fish. It was awesome! This dish looks super delicious. Though I am aware of beer and battered fish, I have not tried until today. Thanks for the lovely outcome recipe and reminding me that I should try out one soon. Sounds yummy--love the beer batter! I think this might be the best history yet! That's right Pepper is widely used in Indian preparation and fresh coarsely pepper tastes wonderful. Your beer battered fish looks lovely. I enjoy battered fish and I really enjoy the flavor of beer battered fish. And no not for the beer, but I really enjoy the subtle sweetness of the beer and the crunch of the battered fish. Thank you for sharing your knowledge of pepper too! Ahh fish and chips! A classic! Always my fall back meal... there is just something so satisfying about fish and chips! Looks delicious! Thank you all for the warm comments. I love you all. Must try a beer batter the next time I fry fish. Frying with a batter rather than a cornmeal/flour coating does yield a better crust. Looks delish, Christine. Another home run! Always enjoy fish and chips. Will have to try using beer in my batter next time. 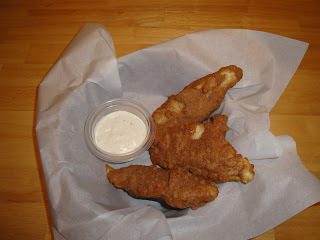 Beer Battered Fish - Reminiscent of the Friday night fish fries in my hometown.... Love it! Your post is excellent the work you put into research is amazing and you can not beat beer battered fish and chips. (From a Englishman)Well done. This looks great--I might have to use halibut, though, otherwise known as the official fish 'n' chips fish of Alaska! Wow, more frying and more seafood... can't go wrong! Comfort food plus.